Posted on June 1, 2015 in Knowledgebase and Support. 1 Comment Tags: chrome, Google, NPAPI, Salesforce.com. Starting a few days ago, Windows 8 users seem to be getting a notice that their Copy2Contact Extension for Google Chrome has crashed. We’re not sure what’s causing this and why it’s only Windows 8 users, but it may be related to the fact that NPAPI (a technology that the Copy2Contact extension relies upon) will soon no longer be supported by Google Chrome. We’ve been able to reproduce the problem on our Windows 8 machines here but have not been able to sort out why it’s happening. Bummer. Fortunately, we’ve been working on a replacement extension that will work with Chrome after NPAPI is gone and there’s no time like the present to try it out. It seems to be immune to the crash issue so we’re releasing it to users having the crash problem for testing. Now go to your desktop and double click the C2C_1.3.0 zip file that you saved to open it. Drag the C2C 1.3.0 folder from the zip file to your desktop. Now open Chrome and click “Menu > More tools > Extensions” to open the extensions list. In the “Browse For Folder” window, find the “C2C 1.3.0” folder on your desktop and click it and then click OK.
You should now see the Copy2Contact for Salesforce.com Extension 1.3.0 installed in your Extensions page in Chrome. Close all open Chrome windows before proceeding with the next step. Go to your desktop and double click the c2c_chrome_helper_v1.0.0_installer file. At this point you may get a message saying “Windows protected your PC”. If you get this message, click “More info” and then “Run anyway“. Accept all the installation prompts to install the Chrome Helper app. Now open Chrome again. 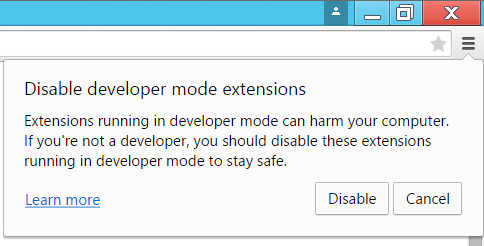 You may get a message saying “Disable developer mode extensions”. If so, click “Cancel“. Developer mode extensions must be enabled for this extension to work.